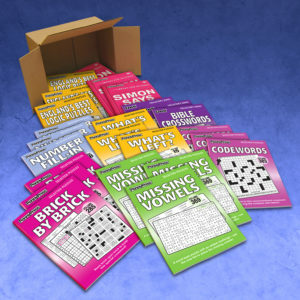 Sampler Packs are a top choice for gift shops, commissary outlets and small retailers, especially when promoting puzzle magazines and books for the first time. Customers choose their favorite puzzle categories, and you see which magazines or books sell best. You can customize your next order and stock only your bestselling categories. If the Sampler Packs sell out evenly, simply re-order a fresh pack. 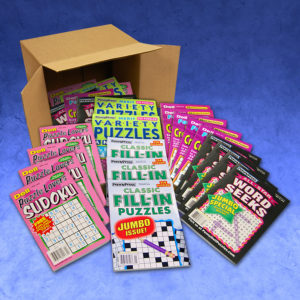 The Magazine Sampler Pack contains 24 magazines in five puzzle categories. 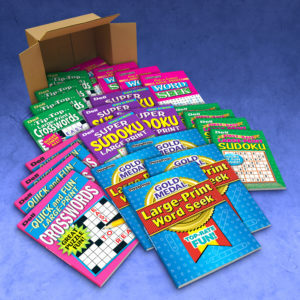 The Specialty Book Sampler Pack contains 24 paperback books, 3 each of 8 popular puzzle types. Sampler Packs are boxed for convenient shipping and neat storage, and are perfect-bound containing no staples.